Sprinkler Daddy is a Regina, Saskatchewan , Canada based irrigation and landscape supply company owned by Rain Pro Supply LTD an incorporated company operated by Sean Stefan & Steve Kesslering. Sprinkler Daddy specializes in providing irrigation and landscape supplies to do-it-yourselfers across Canada and the continental United States. Sprinkler Daddy has an irrigation industry professional with over 30 years experience in designing and installing underground sprinkler systems to provide professional irrigation design services to all Sprinkler Daddy customers. This ensures that your Sprinkler Daddy irrigation system will provide your yard with just the right amount of water coverage. 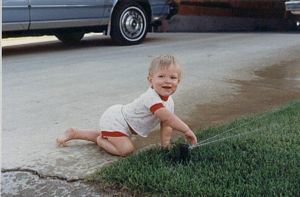 Sean has had an affinity for sprinklers from a young age.